Shishimaru: Who are you? Where are you from? Mysterious voice: For now, call me Black Lion. Black Lion is one of those unusual, one-shot anime movies designed to introduce the populace to the storyline and characters of a particular Japanese manga (printed comic); a sort of visual primer, if you will. Unfortunately, it's frustrating that, at least at present, there is no English version of the Black Lion manga, which dates back into the 1980s. This means we're left with only this well made, tantalizing little bit of story to cling onto. It doesn't mean it's not worth watching, but it does mean that one must be prepared to accept that this 45-minute disc is probably all you'll see of these characters and storyline. It is, in fact, based on the work of famous Japanese artist and writer Go Nagai, perhaps best known for his work on Cutey Honey. Set in the year 1580, Black Lion begins to tell the story of how a mysterious warlord, Nobunaga Oda, is laying siege to most of Japan's known realms for no other purpose than to seemingly just destroy everything. The problem is, none of Japan's prefectures stand a change against Oda's army when it consists of not only samurai and professional horsemen, but also giant robots, tanks, rocket launchers, and all sorts of futuristic armory. No one understands where this technology comes from, but all of the great ninja clans in the region have decided to work together to try and stop Nobunga. Unknown to anyone, one of the leaders of the ninja gathering actually understands this futuristic technology, because he himself is from the future, sent back in time to stop the evil spirit that has possessed Nobunga and somehow allied himself with aliens and interstellar technology in order to wage war in feudal Japan. The ninjas are faced with an almost impossible task when they learn that in order to even approach stopping Nobunga, they will have to deal with ninja hunter Ginnai Doma. Doma is known as an "immortal," because it seems no one can even harm the powerful warrior and, unbeknownst to the ninja, the reason for this is that Doma has been rebuilt as a cyborg by alien forces beyond their comprehension. The reasons for why Doma and Nobunga are doing what they're doing are left mysterious and untold, but the ninja try to create a plan by which they will destroy Doma and get him out of the way. 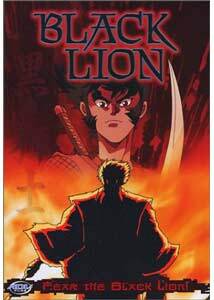 It is this conflict that comprises the bulk of Black Lion, which is only an introduction to the strange "ninja, samurai, and aliens" plotline presumably continued in great detail in a Japanese comic, as no animated series was actually created based off of this "pilot." What is here, though, is still very well made and moves at the pace of lightning. It's a pure action anime with all of its focus on the desperate struggle to destroy a cybernetic swordsman with medieval technology. There's never a dull moment in this 40-minute mini-epic that plays out much like a medieval Terminator. Typical of many action-oriented shows of this style and time-period in Japan, it's also extremely violent and gory; probably one of the most violent anime I've seen in some time. It goes a little overboard at times, so much so that it becomes funny (I was reminded of the ludicrously over-the-top, non-stop gore of Fist of the North Star), but to its credit, it never ruins the core of the story, which is definitely very creative and interesting. It's frustrating that this isn't a series for the obvious reason that this wonderful setting, featuring a mix of alien technology and classic ninja/samurai storylines, won't be used again. Sure, Go Nagai's manga still exists, but as I previously said, it's probably a relatively hard-to-find item and likely not translated. Image Transfer Review: Despite the age of the movie, the transfer manages to make it look quite lovely and clean without the usual enhancement of natural flaws in tradtional, cel-based artwork. There's no grain or pixelization, and the source is extremely clean, meaning there's none of those annoying speckles all over the animation layers in in the backgrounds. Sure, the artwork is a little raw, but it looks wonderfully good in such a smooth transfer. Audio Transfer Review: The stereo soundtrack is rather nice and gets appropriately loud and swelling when it needs to, but never sounds like it was artificially mixed onto DVD to sound more elaborate than it naturally is. While there aren't many directional effects, the soundstage is definitely solid and really fills the room, lending a certain theatrical quality to the anime. The English dub is passable, but nothing special. Given the rural, Japanese setting, the original language track sounds much more authentic. Also, the English track makes some heavy dialogue alternations, often changing the tone and original intent of the story. Worth a look, Black Lion is an intense, quick dose of powerful story-telling. It's disappointing there's no series to accompany it, but I suppose just this killer introduction is better than nothing.